I used to be all about canned beans until my friend Heather convinced me start cooking my own (much cheaper and much tastier). Since then, I've been buying up dried beans and haven't looked back! 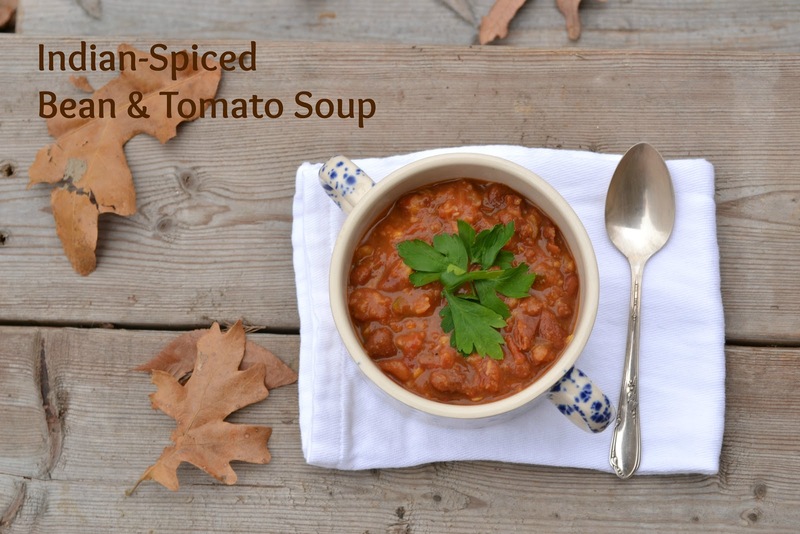 One of my favorite ways to use cooked beans is in soups, and this recipe has been in my rotation for a few weeks now. 1. Heat oil in a 4-quart pot over medium heat. Cook onion, stirring occasionally, until softened and golden, about 8 minutes. Add garlic, ginger, jalapeno, and spices; cook, stirring occasionally, until fragrant, about 2 minutes. 3. Coarsely mash the tomatoes and beans using a potato masher until reached desired consistency; stir to blend. This is a very thick and hearty soup that is perfect with pita chips on the side. It is inexpensive to make since dried beans are a steal, and if you have a bulk spices bin at your disposal, you can buy the spices for next to nothing. It's also very good for you with the high protein and fiber content from the beans and healing properties of the warm spices. If you are on a low-calorie diet or simply looking for a healthy bowl of soup with lots of flavor, this is the soup for you! Oh boy, this sounds absolutely delicious! Sounds delicious! We also stopped using canned beans a while ago, we now buy dried beans in bulk, they taste much better, are softer and are less expensive! That is my kind of soup I am thinking.. Will be giving it a try.. I have been soaking dry beans and cooking them for years. It is easy and cheap. Your soups sounds yummy. I love cumin as an ingredient. Looks great! Don and love soup here this time of year...well always really! We make a great veggie soup with a 15 bean mix in it...Yummy! I love that yours looks nice and thick...I love it that way!! Happy Monday!! This looks and sounds really good. I'll have to try it-always on the lookout for good vegetarian recipes. Ooh! This looks really yummy!!! This looks and sounds like a wonderful soup. Love the seasoning and flavors in it. Another yummy looking recipe! I am going to have enough recipes to start a "Tammy" section in my cook book before long! I really need to start with dried beans and quit buying canned. On my list. And your photography is so pretty. Thanks for boot scootin' on over to join up at the Old Time Party! Mmm, this sounds good. I'm a vegetarian and am always looking for new bean recipes. Gonna have to try this, thanks! Tammy, this looks so good. I'll have to give it a try. Love soup when it's cold. Thanks for stopping by, and I'm a new follower. I rely on canned beans a bit. I need to give that up! I like the spiciness of this recipe. This looks and sounds absolutely delicious. I'm a semi-vegetarian and try to eat very nutritiously, so I'm anxious to try this recipe. Thanks! I'm adding this to my Sunday Soup Series for next week. Looks yummy! Oh this sounds marvelous! I might leave out the cinnamon though. For some weird reason, while I love cinnamon, I don't like the taste of it in soups or chilis. That looks yummy Tammy, and I love your soup bowl. Really cute! Looks delish! We love Indian good. I really want to start making my own beans. I usually use canned. Thank you for the reminder. Sounds amazing! What a wonderful combination of flavors! Thanks for sharing at Meatless Monday! Indian spiced bean soup looks delicious, thanks for sharing with Hearth and Soul blog hop. I am highlighting this recipe on this week. Must be yummy. Here in India, it is our usual practice to cook our food (daily like this)!! we love spices.